Silver Wheaton's business is different from other precious metals companies, and it's all about the margin. Silver Wheaton Corp. (NYSE: SLW) is a precious metals company that makes its money selling silver and gold. But it's vastly different from miners like Newmont Mining Corp (NYSE: NEM) or Barrick Gold Corporation (NYSE: ABX). And a key area to watch is margins. Gold and silver mining is a capital-intensive business, involving large machines and huge investments. In other words, there's a lot of cost in the business and that can make it hard to turn a profit when commodity prices are falling -- like they are today. For example, Newmont, one of the largest gold miners on the planet, had all-in sustaining costs of roughly $885 per ounce of gold in the third quarter. Barrick's costs were $771 per ounce. All-in sustaining costs are a rough estimate of how much money it takes to pull an ounce of gold from the ground. And those are pretty good numbers in the gold mining industry, particularly since gold is trading hands near $1,000 an ounce. To give a reference point, just 12 months ago Newmont's all-in sustaining costs were closer to $1,000. The severe drop in gold prices has led the miners to put in some hard work on the cost-containment side. Cutting costs like that, however, isn't easy and there's only just so far it can be taken. Moreover, costs tend to move in a cyclical pattern, rising when precious metals prices are high and dropping when profits start to dry up as commodity prices fall. The impact of these swings is huge. 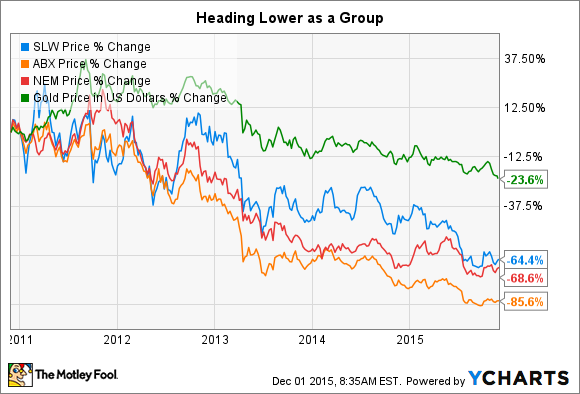 Newmont, for example, boasted gross margins of around 60% and operating margins of 40% or so when times were flush. Barrick's margins were similar. But those numbers crashed as commodity prices plummeted. Newmont's gross margins are currently hovering around 40% and its operating margin is around 20% (it was just 10% or so in 2014). Once again, Barrick's numbers have fallen notably, too. So have Silver Wheaton's, but there's a big difference. Silver Wheaton is a streaming company, which means it pays miners up front for the right to buy future silver (about 60% of revenue) and gold (about 40%) production at reduced rates. Right now its costs are about $4 an ounce for silver and $400 an ounce for gold. That's all it has to pay. Which is why its gross margins are in the 40% space but its operating margin is in the high 30% area -- roughly 50% higher than Barrick and Newmont. But that's in a tough market; back when gold and silver prices were higher Silver Wheaton's gross and operating margins were over 70%! The bottom-line impact of this is pretty telling. Newmont has lost money in three of the four full calendar years since precious metals peaked in 2011. Barrick lost money in one of those years. Silver Wheaton hasn't bled any red ink. Silver Wheaton simply has more room to take the hit from falling silver and gold prices because it avoids the costs of owning and operating mines. It's wide margins are the result and what's given it the earnings staying power in this long downturn. At this point you might be asking yourself if Silver Wheaton is the perfect mining stock. It's not. There's one really important risk to consider: access to capital markets. Silver Wheaton's business model relies heavily on accessing the capital markets. If the company can't do that, for any reason, growth investments slow or even stop. That shouldn't impact the business it has in place, but it certainly changes the long-term outlook. There's also another not so minor risk specific to Silver Wheaton today; Canada says it owes back taxes. Silver Wheaton believes it's in the clear, but if it loses this tax case it could have an immediate negative impact on results and a lingering one since it could lead to higher taxes on an ongoing basis. You'll want to watch this company-specific issue closely if you decide to buy in. Silver Wheaton isn't a perfect investment by any means (no company is). But if you are looking at the precious metals space, this is one company worth a deep dive. Its business model is different from traditional miners like Barrick and Newmont and one important area it shows up is in the margins. While the entire industry is down and out, now might be a good time to examine this discrepancy.